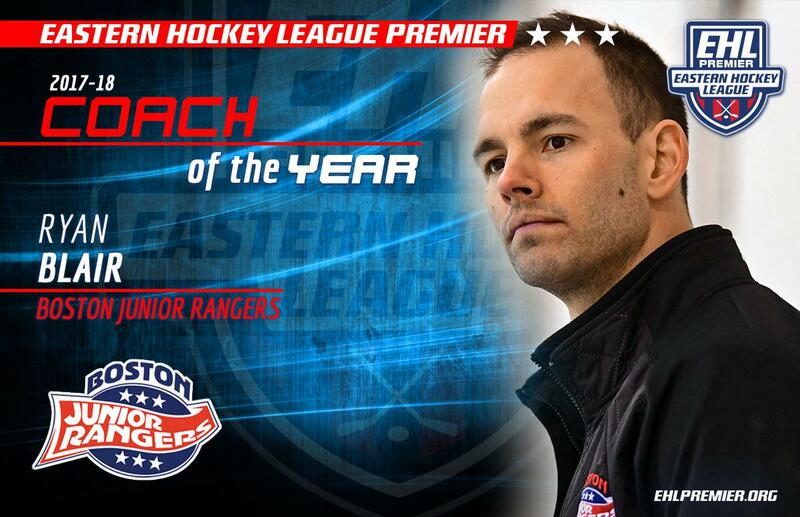 BOSTON, MA -- The Eastern Hockey League Premier (EHLP) is pleased to announce that Ryan Blair of the Boston Jr. Rangers has been named the 2018 Coach of the Year (COY). In his 2nd season behind the bench for the Rangers, Blair led the team to the Regular Season Championship with a record of 37-4-3. The Rangers then got through the New England Wolves in their first playoff matchup, and the Vermont Lumberjacks in the North Conference Finals to punch their ticket to the EHLP Championship Game. The Coach of the Year award and all other league honors, are voted on by the coaches in the EHLP. "I am very happy to see Ryan receive this honor," said Mark Kumpel, the EHL's Director of Hockey Operations. "Being named Coach of the Year is great achievement, and an incredible feeling to have earned that respect and recognition from your peers. Ryan has grown tremendously in 2 seasons behind the bench for the Rangers. He is without a doubt a huge asset to that program, and his now back-to-back Championship appearances proves just that. Goodluck to Ryan this Sunday in Providence!" 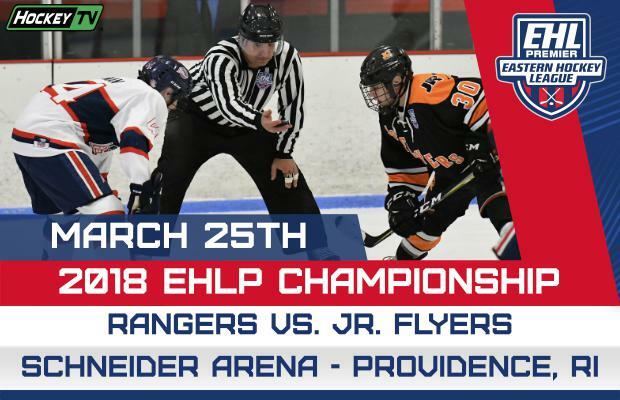 As Kumpel mentioned, Blair and Rangers are heading to Providence, which is the site for the EHLP Championship Game on Sunday against the Philadelphia Jr. Flyers. It should be a great matchup based off of the two regular season meetings that each needed overtime to decide a winner. Rich DeCaprio is the General Manager of the Rangers and also serves as the Head Coach for their Eastern Hockey League (EHL) team. The obvious goal is to win on Sunday, but outside of the Championship Game, DeCaprio puts a lot of value in the job Blair has done while helping push players up the organization's ladder of development. "Blairsy has been a pleasure to work with," said DeCaprio. "He brings a wealth of experience with him to the rink every day, and our organization is better because of him. The efforts that he puts towards everything we do are second to none, and he is beyond worthy of this honor." The 2nd place finisher for the COY honor is Adam Houli (New Jersey 87s) and 3rd place is Brett Skalski (Philadelphia Jr. Flyers). Friday, the EHLP will announce the 2018 Most Valuable Player (MVP).